Set in the heart of New Orleans, MOONLIGHT SINS (Avon Books; January 30th; Mass Market Paperback), is the first book in the all new de Vincent series. 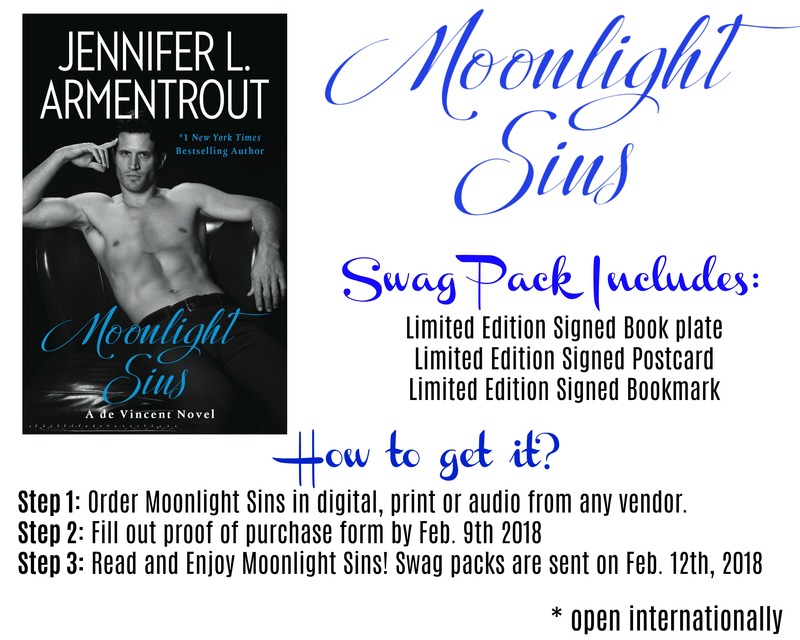 New York Times bestselling author Jennifer L. Armentrout invites readers to enter the world the de Vincent family, three brothers with a dark reputation and notorious family history. Lucien de Vincent – the wildest, most unpredictable brother – is having a bad week. His father has been found dead in the most suspicious circumstances. His older brother is bribing the police to avoid a scandal. And the more he spends time with, Julia the new nurse taking care of his troubled sister, the more he can’t imagine being without her. Lucien may be the unrepentant bachelor of the family but there’s something about Julia that makes him want to lay himself bare. But family secrets are starting to emerge. And the past could not only bring down a dynasty but destroy Julia in the process. Julia knows better than to get wrapped up in Lucian. He’s from a world she can’t relate to. Plus, he’s her employer. But his wicked touch and sensual promises are too much to deny. What starts with a kiss ends with so much more.